Google has released a free mobile app that pulls content from different websites into one place and lets people build what looks a bit like their own personalized online magazine. Called Google Currents, the app came out on Thursday, one day after a similar app called Flipboard was released for Apple’s iPhone. Flipboard has already been a hit on the iPad, and many people had trouble getting started with the iPhone version when it came out, presumably because its servers were overloaded. One big difference is that Currents runs on both Android and Apple iOS devices, while Flipboard is only for iOS. Yahoo offers yet another similar application, called Livestand, and others such as Pulse and AOL Editions are also in the game. Like Google Currents, they’re all free to download and use, not counting the network charges. A common thread is that they allow people to select content from around the Web, such as news, photos, or their own Facebook and Twitter accounts, and arrange it on the screen in a way that lets them flick through the content like pages in a magazine. Google posted a video demo of its app in a blog post. It partnered with 150 publishers, including Forbes, Al Jazeera, PCWorld and Zagat, to bring articles and other content to its app. 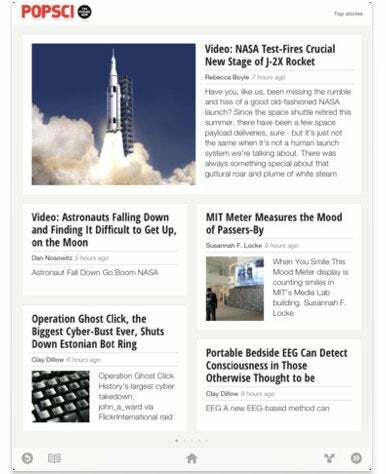 It has all been formatted for the mobile devices to make it easier to navigate, watch and read. Google also launched some self-service tools to help smaller publishers, who might not have their own mobile software developers, to convert their content so it can be viewed through Google Currents.